The smoothness and transparency of a high-end silk dome tweeter combines with top-flight component woofer performance to create a loudspeaker system with exceptional refinement and dynamic capability. 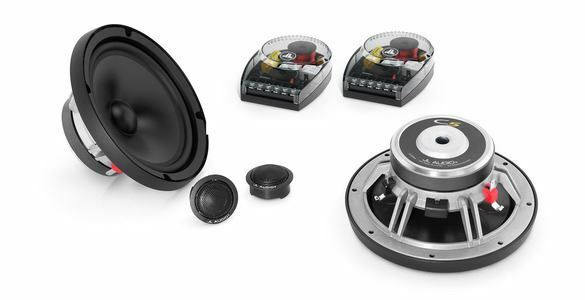 The C5-650 component system features 6.5-inch (165 mm) component woofers with die-cast alloy baskets and Kurt Muller cones and suspensions. This woofer benefits from JL Audio's vast woofer design experience and advanced modeling systems. The C5 component tweeters are built with 0.75-inch silk dome diaphragms that deliver smooth, extended response, on and off axis. Flush-mounting and surface-mounting fixtures are included to fit a wide variety of installation needs. The flush-mount fixtures feature our RSR (Ratcheting Swivel Rotation) mechanism to allow precise tweeter aiming after installation. C5 crossover networks are compact and built with premium component parts, including Mylar® capacitors and segmented air-core inductors. Four levels of tweeter attenuation are provided, as well as three levels of mid-range presence adjustment, for twelve possible voicing combinations! Woofer grilles are included, each consisting of a black grille tray and a black steel mesh grille with an electroformed JL Audio logo.